RELIABLE – 3 Year Warranty. HEAVY DUTY – Industrial stainless steel finned heater(s). CAPACITY – Holds ten (10) or twenty four (24) 25″ x 36″ (63.6 x 91.4 cm) screens of any type. POWERFUL – One (1) 200 CFM (5.7 CMM) air flow blower or two (2) 290 CFM (14.2 CMM) air flow blowers. CONSISTENT – Pressurized cabin with positive air flow keeps out contaminants even if an air leak occurs. EFFECTIVE – Screens sit horizontal on removable shelves (angled to provide edge contact only). SECURE – One (1) sealed latching door 10 screen or two (2) individually sealed latching doors on the 24 screen unit. 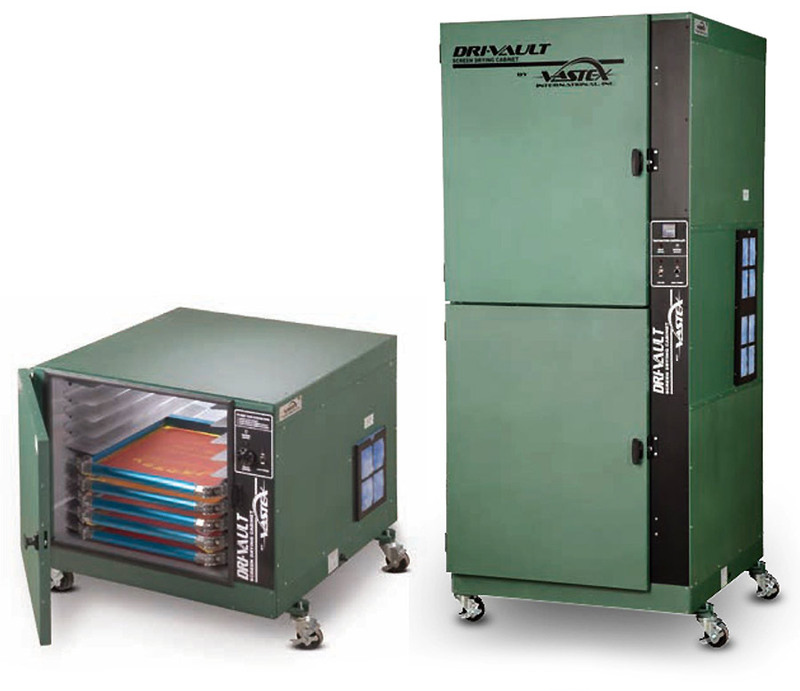 CONTROL – 10 screen cabinet has Hi-Low heat adjustment OR the 24 screen cabinet has breaker on/off switch, pilot light, digital temperature control, both have ability to run air only or variable heat. EFFICIENT – 4″ (10 cm) exhaust duct for contaminated air removal. PRECISE – Light tight heavy duty double wall. EASY – Simple to clean or replace filtered air intake.